Nobody likes to clean, well, almost nobody.Your closet is one of the most high-traffic areas of your home. You use it daily, and because you do, it tends to become a dumping ground for some different items. Fall is a great time to clean closets--maybe because many of us look at fall as a time of renewal (back to school and back to regular schedules). Cleaning closets does not have to be stressful, although I won't kid you, it can take a bit of time. But it's time well spent in the long run.Clearing your closet helps to clear your schedule and your mind - along with lots of image obstacle clutter that may be standing between you and your career goals. Before you even start to think about your closet, make a list of all the items you will use when you clean your closet. This would include major equipment such as a vacuum cleaner, floor polisher, carpet shampooer, and sweepers. Smaller items like brushes, gloves, work clothes, and rags should be looked at as well. Last but not least are all the cleaning products you use. Like most things, cleaning products have a shelf life. This is a good opportunity to see how often you do use a certain product and if it's still fresh enough to be effective. Now that you have an inventory of your cleaning equipment and supplies, you will have a better idea of how much closet storage space you will need. If your space allows, you may find it better to create more than one closet, perhaps one in the bathroom or laundry room to make it more convenient. Step one: Strip. Strip down your closet of everything inside. Take everything, and I do mean EVERYTHING, out of your closet. Start with a clean slate. The only way to straighten out not only your wardrobe but also your mind, is to do what you dread of; empty your closet space. Although some might think that this is actually an unnecessary step, I strongly recommend you to reconsider. 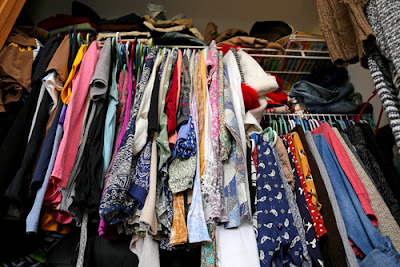 By pulling every piece of garment outside your closet's space, you will actually get a chance to check what exactly you have been hiding in there; for who knows how long. By emptying your closet, the mess you now think as inevitable might become an organized zone of personal enhancement that you have never before dreamt of having. Step two: Sort. With all items removed from your closet, you can begin sorting through what you need to keep, what you can donate and what needs to be tossed out because no one will want THAT old thing. Make piles for all these items. You will be tempted to start putting items back in your closet, piece-meal, but don't do it. Wait until you have a final pile of items that you are keeping before adding anything back to your closet. Step three: Clean it up. Before you start thinking about what to put where; before you hang up your clothes, now is a good time to clean that closet. Vacuum the floor and wipe down any corners and baseboards. Give closet walls and doors a wipe-down with a vinegar/water solution (one part vinegar to two parts water). Step four: Now that you have "everything out in the open," it is time to begin the inverse process. Putting everything back inside the closet is the step that you will need some creative thinking to manage the volume of the things that are now scattered all around the room. Cardboard boxes, plastic bags, and every other type of small storage containers can keep your outfits and bedclothes in-order. Creating handwritten labels and adding ribbons for some color, will give you an outcome that is usually portrayed in glossy house magazines. Purchase the right type of hangers for your clothes and place them in your closet according to their type and height when hanged. Keep shirts closer together, hang pants about their use and place your various accessories in containers that you can easily reach later (i.e. on the floor or lower drawers). Designate a space to put the clothes which are not currently in season, like heavy overcoats when it is summer or you were bathing suit when it is winter. Hats can be placed in bigger baskets, belts can be hanged on the back of your closet doors, and shoes can be placed on specially designed ranks on the floor. Finally, remember to give away clothes, shoes, accessories or other things you never wear or use. Your local church charities can be a perfect opportunity for you to show that you are a philanthropist while a variety of organizations offer house pick-up services to take clothes and give them to those less fortunate than yourself. 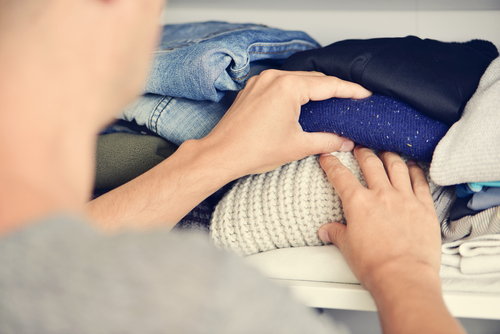 Cleaning-up the messy closet will let you again experience how it feels to be organized. Additionally, you will always be prepared to put something on that it is not full of wrinkles or needs immediate washing. You can also invite over a friend to help you out, as another person's feedback on your current wardrobe can give you a hint on what you should focus on purchasing next time you are about to do some "serious" shopping. When it comes to cleaning out your closet, all it takes is a little will, a little drive, and a few garbage bags that may lead you to make even some money while doing it. Once you dive in, you will find that it isn't nearly as dreadful and boring as you imagined. In fact, you may even find a few treasures you forgot you had treasures that have been kept hidden under a mass of clothing, shoes, and who knows what else in your closet. So get the shovel because it's time to do some clearing out! All things considered, your diligent work, venture back and completely appreciate the your reward for all the hard work. How would you feel? Quite remunerating, eh? You will all of a sudden ordeal a feeling of mental clarity and smoothness as a consequence of days.